Is this the year that your small business makes a leap in its online capabilities? The availability of technology and dropping prices now make the option of using project management software more feasible than ever. Whether you have a company of three or three thousand, there’s no longer reason to avoid improving operations online. The StrikeBase cloud collaboration platform offers straightforward and comprehensive business solutions. StrikeBase (www.strikebase.com) is a web-based project management and collaboration platform. 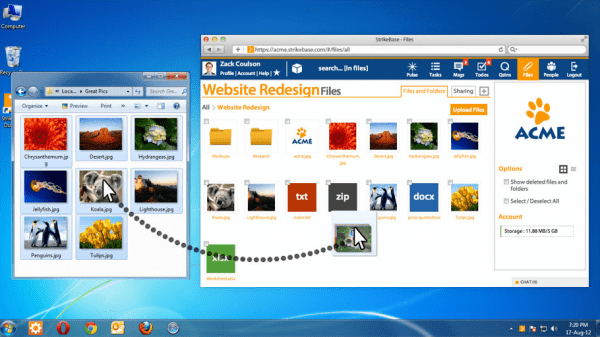 Cloud storage enables easy desktop or mobile collaboration. Team members can communicate freely with each other as well as with clients. Project management tools make it easy for a business to coordinate efforts on multiple projects while maintaining a clean workflow. 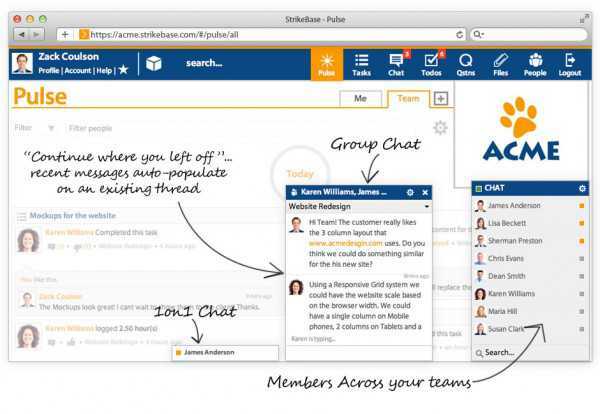 Team members in small and medium-sized enterprises often uses multiple services such as Skype, Gtalk, Box, Basecamp, and Asana to collaborate on projects. These services were not always designed to work with one another. Incompatibility creates problems such as fragmented and redundant data, inability to search data across services, multiple user logins, and access complications for both administrators and users. StrikeBase looks to eliminate these issues by offering a comprehensive suite of applications that leverage the strengths of one another and work cohesively on a single platform. Threaded, 1-on-1 and group conversations with members on your team from the web or the StrikeBase Desktop Client for Windows and Mac. All conversations are logged, tagged by project and indexed – making them instantly searchable by keyword. 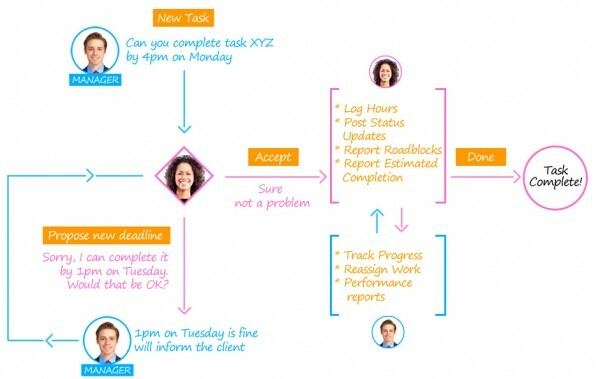 Comprehensive workflow based task management featuring time tracking, status updates, task assignment/re-assignment, detailed analytics on team member performance, workload management, time-sheets and more. 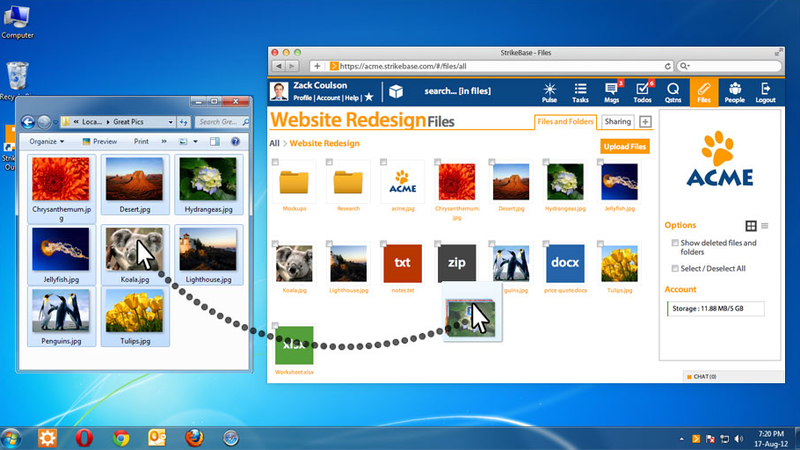 Cloud based file storage with Dropbox like desktop folder syncing coming soon. Also included are folder sharing, unlimited file versions, drag-and-drop support, notifications when shared files are updated, and more. Simple personal and group checklists that are quick and easy to create from either the browser or the desktop client. Automatically track every question you have ever asked along with its resolution status, ensuring that no question ever goes unanswered. Team member updates from across Tasks, Files, ToDos and Questions in a filterable timeline very much like the Facebook newsfeed. Each company can customize its appearance, permissions, and project filters to best suit its needs. Video tutorials guide new users through using all of the features, which sound complicated, not to mention overwhelming in number, but are actually easy to implement. StrikeBase is a product by the professional website design and IT consulting company GDiz, based in India. 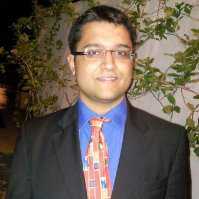 Founder Gaurav Christopher DCosta attended school at the Xavier Institute of Engineering and has served as the CEO of GDiz for nearly eight years. Still in beta, take advantage of a free 14 day trial period. Billing is monthly with no contractual obligations. The first 3 users are Free and additional users are priced at $9.95/user/month. StrikeBase software facilitates an unlimited number of projects and provides bank-level data security. Support is available via Twitter, Facebook, or email. For more information, visit here.